Areas of expertise: condition monitoring and advanced signal processing for the analysis of nonstationary data. She worked as an RA on the Engineering Nonlinearity project from October 2013 to February 2015. She was appointed as a Lecturer at the University of Sheffield in March 2015. Areas of expertise; Dynamics with friction, and experimental testing. Alessandro Cabboi (Cambridge) received a MSc from the University of Cagliari in Construction Engineering in 2010 and subsequently a PhD in Structural Engineering in 2014. The PhD work, supervised by Prof. Carmelo Gentile (Politecnico di Milano), was focused on the automation of operational modal analysis technique in application to permanent dynamic monitoring systems installed on historic structures and infrastructures. The main goal was to propose and compare some vibration-based damage detection methodologies. He worked on the Engineering Nonlinearity project from March 2014 until September 2016. He is now a Research Associate at the University of Sheffield. Areas of expertise: Nonlinear dynamics, energy harvesting. From Sept 2012 to April 2013 he was funded from Engineering Nonlinearity and again from April-Dec. 2014. He is now a Lecturer at the University of Glasgow. and identification. Nikolaos Dervilis (Sheffield) obtained a BSc from the National University of Athens in Theoretical Physics, an MSc from Electronics and Engineering from the University of Edinburgh and obtained his PhD in SHM and machine learning of wind turbines from University of Sheffield. He worked on the Engineering Nonlinearity project from October 2013 until January 2016. He is now a Lecturer at the University of Sheffield. Areas of expertise; Dynamics of rotating systems and experimental testing. 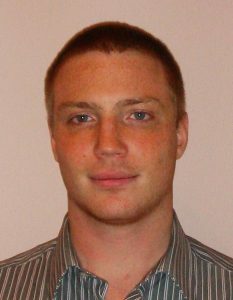 David Ehrhardt (Bristol) graduated with BSc (’09) and MSc (’11) from Bradley University and received his PhD (’15) from the University of Wisconsin-Madison. He has expertise in structural dynamics with applications dynamic testing of exhaust components for heavy industrial vehicles, dynamic testing of skin and structural components for hypersonic air vehicles, and use of nonlinear normal modes in the test and analysis of structures with the goal of creating a calibrated model for improved dynamic response prediction. He worked on the Engineering Nonlinearity project from April 2015 until August 2016. He now works for the US Air Force. Areas of expertise; Bayesian modelling and identification. Uncertainty analysis for structural dynamics. He worked on the Engineering Nonlinearity project from Sept 2013 until January 2015. He is now a Lecturer at the University of Liverpool. Areas of expertise; Nonlinear dynamics and control. Mehdi Hendijanizadeh (ISVR, Southampton) has a BSc degree in electronic engineering and an MSc in power-electronic engineering. He joined the Electro-Mechanical engineering group of university of Southampton as a PhD candidate in 2010. He conducted his research on harvesting energy from low frequency, large scale ambient vibrations. His PhD research led to designing and manufacturing some energy harvesting prototypes including a ball screw based energy harvester to extract power from vertical movement of a boat. He worked on Engineering Nonlinearity from March 2014 until Sept 2015. He is now a Research Assistant at the University of Southampton. Areas of expertise; Nonlinear dynamics, hardware-in-the-loop and testing. Julián Mauricio Londoño Monsalve (Bristol) was awarded a Bachelor in Civil Engineering in 2000 and MEng in Industrial Automation in 2006 from the National University of Colombia. In November 2006, he moved to Italy as a doctoral student funded by an AlBan scholarship from the European Commission. He was awarded a PhD in Construction Engineering in January 2010 from the University of Naples Federico II in Italy. In late 2010 he was awarded a prestigious Newton International Fellowship from the Royal Society and the Royal Academy of Engineering. He worked on Engineering Nonlinearity from February 2013 until March 2016. He is now a Lecturer at the University of Exeter. Areas of expertise: cochlear dynamics using finite element modelling. He was funded from Engineering Nonlinearity from November 2012 to May 2013 and again from September 2015 until June 2017. He is now a Lecturer at Tianjin University in China. until September 2016. He is now a lecturer at the University of Exeter. Thibaut Putelat (Bristol). Areas of expertise; Dynamics of systems with friction. He worked on the Engineering Nonlinearity project from April 2013 until January 2017. Ludovic Renson (Bristol). Areas of expertise; Nonlinear normal modes. He worked on Engineering Nonlinearity from October 2015 until March 2016. He is now a Marie Curie Research Fellow at the University of Bristol. a lecturer at Swansea University. Areas of expertise; Nonlinear dynamics and statistical energy analysis. Graham Spelman (Cambridge) graduated from Cambridge University in 2009 with a degree in Aeronautics. After this he worked briefly at the ESI Group, in the San Diego, developing the VA One software for the study of ’buzz, squeak, and rattle’, before starting a PhD in the Dynamics and Vibrations Research Group at Cambridge. His PhD was on Energy Scattering in Weakly Nonlinear Systems and concerned the transient response to impacts of structures with geometric irregularity. He worked on Engineering Nonlinearity from November 2012 until December 2015. He is now working as an RA at the University of Cambridge. Daniela Tiboaca (Sheffield) had an associated PhD project on using Markov Chain Monte Carlo (MCMC) sampling methods, Bayesian inference and probability concepts for system identification in structural dynamics. She finished her PhD in March 2017, and also worked on Engineering Nonlinearity as a RA from February–May 2017. Areas of expertise: Nonlinear dynamics and Friction modelling. He worked on Engineering Nonlinearity from May 2013 to April 2015. He is now Assistant Professor at the Indian Institute of Technology Kharagpur. Areas of expertise: Modal testing and laser vibrometry. He worked on the Engineering Nonlinearity project from April 2014 until March 2015. Michele Zilletti (ISVR, Southampton) graduated in Mechanical Engineering in 2007 from the Universitá Politecnica delle Marche, Italy. As part of his studies he spent a year at the Friedrich-Alexander-University of Erlangen-Nuremberg, Germany funded by Socrates Erasmus scholarship. In 2008 he joined ISVR at the University of Southampton, and in 2011 was awarded a Ph.D. for a thesis on active vibration control under the Marie Curie Scheme (FP7). From 2012 to 2013 he worked as research fellow on active vibration and noise control at the Universit degli studi di Udine, Italy. He worked on the Engineering Nonlinearity project from April 2014 until October 2016. He now works for Cambridge Mechatronics Limited.